On private setting. Madison River Valley. Come enjoy our spacious Montana log cabin duplex with stunning mountain views and privacy. Authentic ranch oak furniture and classic western details. Feature kitchen (roomy with full size appliances including a dishwasher), comfortable living room, fireplace, porches that offer mountain views while grilling on the deck. 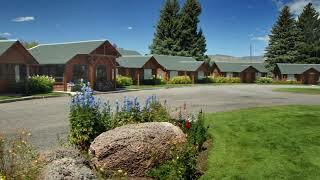 El Western and Ennis in the Madison Valley make a great destination for a vacation in Montana. Fishing friends, traveling families or couples will enjoy the space and flexibility of the Mountainside Cabins. Daily housekeeping, WIFI and flat screen satellite TV are all included.Our wide variety of cabin and lodge accommodations are perfect for a business meeting or retreat, Intimate weddings, family reunions or romantic getaways. Settle in to your Mountainside cabin and plan your next adventure. 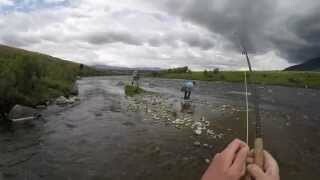 The Madison River stretches nearly 70 miles from the edge of Yellowstone National Park and is a wild trout fishery. There is a public access to the river just 400 yards from the cabin. Find and land those Rainbow or Brown beauties! Sleeping arrangement: Beds are doubles or queen size. Sleeper sofa double in the living room. Tile bathrooms have separate shower and tub. Our multi-cabin, multi lodge El Western is surrounded by our trademark towering spruce trees, lush green lawns and colorful flowers. The Old West is alive and well right here and in Ennis, Montana. Main Street is has excellent restaurants, western bars, shops and galleries. Get information on current area river conditions at one of tackle shops. Nearby you can pan for gold in Nevada City. The camp chef will love the large kitchen and the kitchen extras: dishes and cookware, coffeepot, toaster, microwave, refrigerator, stove and sink. Our exceptional Montana log cabin has a relaxing front porch and is surrounded by the beauty of the Rockies and abundant wildlife. Mountainside Cabin is available from April 15 to October - the best time of the year to be at the El Western. By the end of June, the Madison River ends its run-off and the Salmon Fly hatch brings fisherman out of hibernation. Fall brings chilly nights and the welcome fireplaces of our Mountainside cabin. You always have a beautiful backdrop thanks to our carefully maintained lawns and gardens. There's lots of fun small-town happenings in Ennis and we are just one hour from Yellowstone National Park. Visit Old Faithful and the Old Faithful Inn, the Grand Canyon of the Yellowstone, and the Upper and Lower Yellowstone Falls. Hike along boiling mud pots and steaming crystalline formations. Closer to home - just 16 miles - is the Historic mining town of Virginia City. Walk the boardwalks and peer into windows to the past. Stores were abandoned with stocked shelves and left untouched for more than a century. A fascinating and fun peak at the Old West. Daily and weekly rates available - 2 night minimum. Rates based on 4-person occupancy. Does not include 7% state tax. Add. guests are $15 per night per person. Deposit Payment: The required one-night deposit is non-refundable. Final Payment: Payment of the reservation balance is due 30 days prior to arrival and is non-refundable.